Welcome and congratulations on being accepted to Coe! So what is the next step? Below you will find more information about what you need to do to officially become a Kohawk. Students applying for financial aid need to complete a Free Application for Federal Student Aid between October 1 and March 1. Submit your application online. How do I confirm my enrollment? It’s easy! Submit your $300 non-refundable enrollment fee to Coe prior to May 1. By doing so, you will officially become a Kohawk. Click here for enrollment fee submission options. What is the best way to meet your future classmates? Have an entire open house for all admitted students! Admitted Student Weekend is a great opportunity to get one last look at Coe before making that final decision. Hundreds of accepted students will be on campus visiting with professors, going to classes, experiencing "The U" and staying on campus. Accept your Impact Award during your visit! Contact your admission counselor to learn more. Please Note: You must apply to Coe College and be admitted unconditionally to receive this award. The Impact Award is in addition to the Trustee Scholarship (valued up to $31,000 per year). Your Impact Award acceptance visit must be scheduled through the Office of Admission and take place between September 1, 2018 and January 26, 2019 of your senior year. 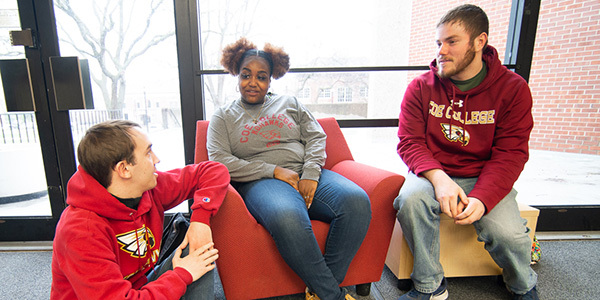 Coe students are dedicated to academics, athletics and the arts. Sound like you? Apply today using the Coe College Application or the Common Application. Give us a few hours and we’ll give you the best four years of your life. All you have to do is schedule your visit. Admitted seniors may even be eligible to accept the Impact Award when visiting. Begin the journey of your life at your new home away from home. If you’re ready to become a Kohawk, submit your enrollment fee today. The average financial aid package awarded to incoming first-year students in the fall of 2018 was over $42,300. Learn more about funding your undergraduate education here.